The Q&A with the participants will be hosted by David Weinstein, Roulette Director of Special Projects. This collaborative, durational performance between Michael Schumacher, Ursula Scherrer, and Liz Gerring will span 4 hours. The audience is welcome to come and go at any point in the event, and also to move around to observe different points of interest throughout. The three principal artists have been collaborating for decades – Schumacher and Gerring’s work together dates back to loft performances in the 1990s, and Scherrer joined their experiments in the 2000s. Participants also include members of the Liz Gerring Dance Company and Schumacher’s piano is joined by Leila Bordreuil on cello. 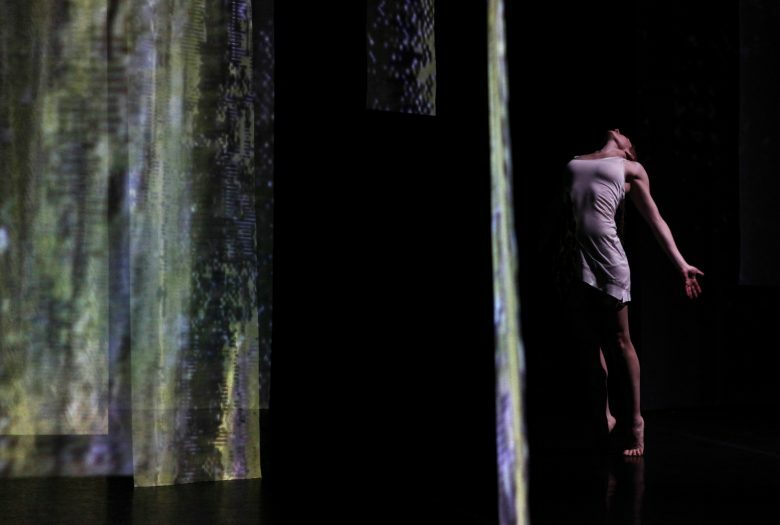 The music, video and dance aspects will respond to one another throughout the duration of the piece, working on similar timing but each improvising through a pre-determined structure in response to a musical score written by Schumacher. Scherrer will place multiple projectors around the hall, breaking the space into distinct visual areas. In preparation, Scherrer filmed details of the dancers’ movements. These close-ups will be projected as well as seen on monitors that are placed around the space. Liz Gerring studied dance at the Cornish Institute in Seattle. In 1987, she received a BFA from The Juilliard School, where she studied with Kazuko Hirabayashi and Doris Rudko. In March 1998, she presented her first piece, a four-hour movement installation, and soon after formed the Liz Gerring Dance Company. Liz Gerring was awarded the Jacob’s Pillow Prize in June 2015 and a Joyce Theater residency and creation award in the same year. In 2016/17 she was awarded a New York City Center Choreographic Fellowship. Leila Bordreuil is a Brooklyn-based cellist and composer from Aix-en-Provence, France. Her cello playing is often improvised, and mainly focuses on texture variations and a collage of phantom overtones and pitched utterances. Through an original vocabulary of extended techniques, preparations, and imaginative amplification methods, her instrument is used as an abstract resonant body to challenge conventional cello practice. Her composed works draw from a similar texture-based musical aesthetic, but also focus on the relationship between sound and space. This presentation is made possible in part with public funds from the New York State Council on the Arts’ Electronic Media and Film Presentation Funds grant program, administered by the ARTS Council of the Southern Fingerlakes.